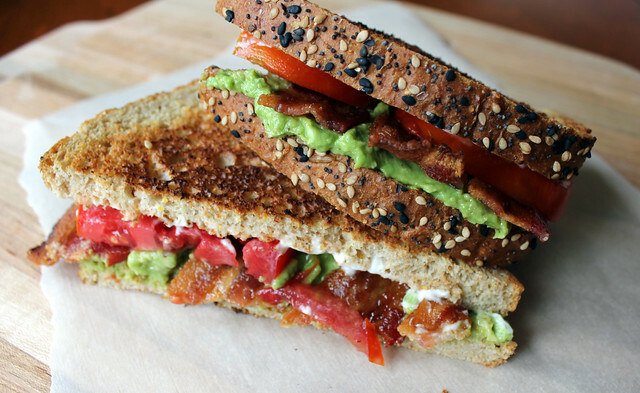 It is hard to improve on a classic like a BLT, but I think this sandwich knocks the original out of the park. I replaced the lettuce with mashed avocado. Be sure to season the avocado generously with salt and pepper. You may have to test it out on a chip to make sure the seasoning is just right! I have found that the best way to cook bacon is in the oven. I line a baking sheet with foil and top with a cooling rack. Using the cooking rack ensures that the bacon is not cooking in grease. Clean-up is easy, just toss the foil away with the drained grease. I really love the combination of sweet and salty so instead of regular bacon I used candied bacon. It sounds fancy but it is really just adding a sprinkle of brown sugar before it goes in the oven. Speaking of bacon, apparently an actor is trying it out as a new currency. Who knows, people do love bacon. I wonder if the value would go up if he candies it. The Perfect Pairing for this sandwich is summer’s final tomatoes. Hopefully you can still find some sun-warmed tomatoes at a farmers market or your neighbor’s garden. Line a baking sheet with foil and top with a cooling rack. Arrange the bacon on the rack and sprinkle with brown sugar. Bake in the oven until cooked through and slightly crisp, about 20-25 minutes. Meanwhile, scoop the avocado into a bowl and mash with a fork. Add a good amount of salt and pepper to taste. When the bacon is cooked through, slice each piece in half. To assemble the sandwiches, spread mayonnaise on one piece of toast (optional), spread the avocado mixture on the other piece and stack with sliced tomatoes and three halves of bacon. You had me at candied bacon! I have to make this. I know! Hard to resist candied bacon. I hope you enjoy!